You may remember September, 17th 2011, the fateful night when Occupiers annexed a square block of Manhattan’s financial district. They called it Zuccotti Park—but we renamed it Liberty Square. It was a great victory. We sparked a global uprising against Wall Street tyranny. Now we’re in Philadelphia for the next chapter of our revolution. We heard the news of Hillary Rodham Clinton’s treachery. We do not view the DNC roll call vote as legitimate. She stole a Democratic nomination that rightfully belongs to Bernie Sanders. She is a true enemy of the people. Her lies have infected the body politic of our global community. Her crimes, revealed by Wikileaks, once punished, will be the end of the Democratic Party. Last night, July 26th, 2016, we fought this injustice. Our revolution was televised. You may remember the broadcasts of the #DNCWalkOut. These revolutionary delegates walked out on the floor of the Democratic Convention and into the pages of history. They cast a vote of no confidence in Hillary’s autocracy and left the dust of neoliberalism in their wake. To further escalate the struggle, we have begun a new occupation. 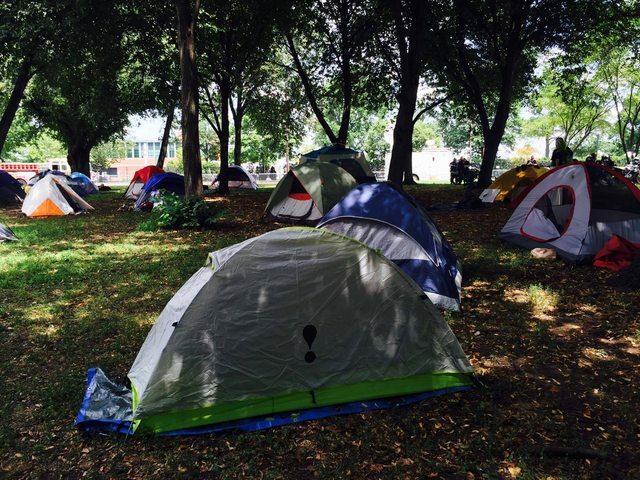 Adjacent to the convention, we have pitched our tents in Franklin Delano Roosevelt Park. This park now belongs to the people and will henceforth be known as Liberty Park. We call on our comrades to join us. We will work together to shut down the convention and the manipulations of capitalism and racism found in our government and day to day lives. Join us to #OccupyDNC by joining #OccupyFDR. Our peaceful presence in this beautiful park will help us strengthen our networks to each other and build political power beyond the campaign of Bernie Sanders. In light of the WikiLeaks’ revelations of top level DNC undermining of the Sanders campaign, we demand a review and possible re-vote in the states with open lawsuits concerning voter tampering. We are at the end of July, take a day off, take a sick day, take two days, join us in the park and let your presence be your action. Come to the park and sit-in against both Republican and Democratic leadership. One betrays us with neoliberalism and the other with fascism. Today we stand in a world that is dominated by critiques of capitalism and possible alternatives. Today we stand in a world in which a Democratic Socialist almost became the presidential nominee, were it not for the undermining efforts of top Democratic National Committee leaders. Our tomorrow is up to you. 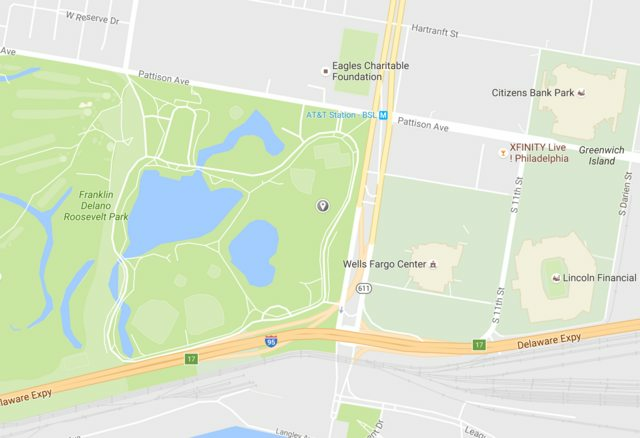 The City of Philadelphia has informally told us that camping will be "tolerated" around the city, including in FDR Park at night. 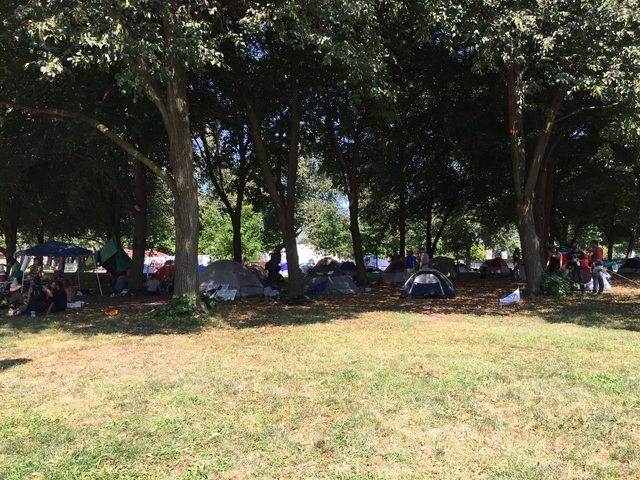 Please fold/pack up your tents during the day - it will be crazy full with activities at FDR Park. Great News! Keep up momentum. Does this mean forum will open up? That walkout should have been led by Bernie Sanders. He ran a great campaign up until he folded & allowed himself to be used as a Judas Goat for the wealthy establishment in backing sHillary Rotten Clinton. You are correct = Drumpf or sHillary is a win for wall street and all corp(se)oRATions and a loss for the environment and the public at large. The walkout should be endorsing 3rd party Jill Stein as the only sane choice for the people to vote for in this election cycle. Jill Stein is very close to being a consensus here. The fling with Bernie had the expected effect of focusing the cadres politically. The "Heart of the Ocean" flies back to Neptune's wine-dark bosom. The now-revealed rigged favoritism of the DNC aligned the cadres' view of what the demonkrapts actually are. More is coming as promised by WikiLeaks. The hostile takeover of the GOOP has actually made its platform less extreme than its traditional establishment's. I'm just thrilled that so many more voters have been energized and become passionate again about politics rather than being resigned to indifference or despair by the duopoly trap. Both Bernie and Trump should be commended for that. There are many areas outside of election politics that need fixing. Our criminal justice system is both broken and a sham. Boards of directors need new untainted blood. Other branches of government can use hostile takeovers just like the Retard-i-can't GOOP's. Difference between a false dem & a Dictatorship? A false democracy will try 2 instill t illusion tat u matter! Yes - ''we stand in a world that is dominated by critiques of capitalism and possible alternatives. 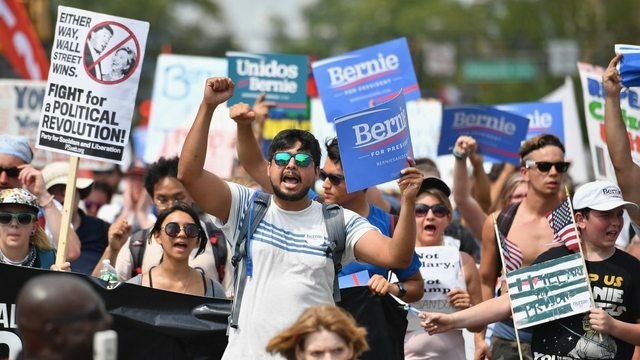 Today we stand in a world in which a Democratic Socialist almost became the presidential nominee, were it not for the undermining efforts of top Democratic National Committee leaders. ''Quisling leaders who are actually in league with and also beholden to .. an Oligarchy that had infiltrated Democracy in The U$A! Educate; Agitate; Organise; Protest & go on to form an intellectual cadre - for a better tomorrow for all. Ur mistake DNC was thinking U could follow t GOP's lead! U forgot that u tried 2 educate 1st. "One betrays us with neoliberalism and the other with fascism." Truth. We need not say more. This has to be a global movement to stop neoliberalism and unfettered capitalism from destroying the earth and the humans that live on it. If this movement isn't global, if it remains within nations, we are damned. The global one percent is organized to the hilt across borders. We must do the same. I would (respectfully of course) disagree slightly here. the u.s. is so powerful that if we could take control of our country and make it a model for the world it would solve many problems outright. much of the world would happily follow and those that don't would be forced to by their populations - seems to me. now that is a very tall order - getting control of our country but recent events show it is possible. I'm not sure, flip, that a Hillary Clinton or Donald Trump presidency is getting our country back. Trump can make some good points at times, I don't disagree with you about that, but handing the nation over to a megalomaniac doesn't seem a good idea. We may have the world's biggest army but we also have the world's greatest disrespect. And, the one percent is organized across borders, we make a huge mistake if the 99% do not organize the same way. We have to start waking up to that fact, imo. Trump will become just another tool of the 1% because, well, he is a member of the 1%. His interests lie there. agreed, neither clinton nor trump would be the one to start to disarm the usa and the world. also agreed about organizing across borders. my only point is that IF we could get control of our government we could change the world. a u.s. govt that moved in that direction would force other governments to do the same by popular pressure. must happen soon or there is no chance. We agree. I think we were both kind of hoping, as were many, that something would come of the Bernie Sanders candidacy, but ho hum, no. He wouldn't have decreased the military enough anyway, one of his weaknesses. Now, if we could get someone like Jill Stein in office, then we might be talking. And, I totally agree, the direction the U.S. takes is often the direction the rest of the world takes, (sadly). So, if we could move in the right direction it would be powerful. Right now, my hope is that the Brits can manage to vote in Jeremy Corbyn to lead the Labour Party next week. Also, what do you think of the fact that Hillary is a known bad quantity and Trump is maybe more of a chance, we don't know what the heck he'll do, but we sure as hell know what she'll do. It's exhausting, isn't it? Trying to come to terms with the state of affairs in this country. Recently Duterte and previously Berlusconi have foreshadowed what Trump may do. The Italians have been there and done that and sincerely offered us their insight: "Having our leader become the laughingstock of the world was No fun." Hillary may have the moral impulse and mechanics but do we really want more "nation building" of daeshed sand castles after spilling more innocent blood in endless wars? No, because the U.S. populace is fundamentally isolationist. The eelites are not isolationist because they lust after the profits possible by escaping the ethical and environmental restraints in the U.S. They want to use human lungs as air filters for coal soot, baby lungs especially because they don't protest or kill foreigners. They want to make deadly chemicals without the environmental oversights developed only after long experience with their ill effects. Do we really want more so-called accidents like Bhopal's? No. In general, the lighter industries are better for developing countries than the heavier ones for human health. Of course, if information is well controlled, people can indeed be harmed without their knowing. Communist countries did this rather well. The British Empire broke up into a pretty good group of countries in terms of the governments, economies, environments, etc. Yes, I think the Brits did have what it took to wind down an empire ethically so we can learn something from them to wind down our Empire which wasn't really of our people. We or our ancestors came here to have some peace and quiet from the horrid Old World after all. A breath of fresh air. The new Leader of the Labour Party of the UK, Jeremy Corbyn addressing the Labour Conference. Worth a watch. They got their Bernie! "A VOTE FOR HILLARY or TRUMP IS A VOTE FOR PERPETUAL WAR! We need to: Think Local! Act Global!! If we want Social Justice ... we want it for everyone, everywhere!! !